The Roman Catholic church of Our Lady Help of Christians & St Lawrence is located in West Street, Olney – opposite the turn for the Olney Centre. Before the 1940s Catholics living in Harrold and the neighbouring villages of Carlton and Odell had very limited means of attending Sunday Mass, or, indeed, any service. They either caught a bus to Bedford or found some means of getting to Olney and, in this respect, they were often helped by Mr Tom Robinson who was part-owner of The Harrold Motor Company. However, on the second Sunday in the month Mass was celebrated in Harrold, at the home of the Gubbins family. During the Second World War Harrold Hall was used to house Italian prisoners of war, many of whom worked on local farms. The prisoners of war had their own Chaplain and local Catholics were able to celebrate Mass with them. 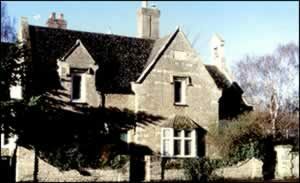 About 1946, due mainly to the efforts and persistence of the Gubbins family, aided by Mr and Mrs Cockings, it was felt that local Catholics needed a base in Harrold. Father Walters, the resident priest in Olney at this time, negotiated the purchase of a hut (probably from Podington Aerodrome). This was duly erected on land purchased from Edgar Clayson. The site was adjacent to the present Playing Field in Carlton Road, and is now the home of John and Jean Saul. For over twenty years this hut served as the local Mass centre under the auspices of the Olney priest. Ever on the lookout for a more permanent building for a church, Harrold Catholics were eventually offered the opportunity to purchase the Old School on The Green. This again was owned by Edgar Clayson, and he agreed to take back the land in Carlton Road in part exchange for the Victorian school building in the centre of the village. Thus, by the early 1960s, work began on transforming the building into a church. This was not an easy task as it had been requisitioned by the War Office and had been used as a storage depot for industrial tyres. Nevertheless, work was completed and the church was duly dedicated as The Church of St Francis Xavier. As with all old buildings there were a few problems and it was eventually necessary to add a damp course and to install electric heating. In more recent years the church was refurbished under the guidance of the priest, Father Ryan. The original hut stands in Odell, although in a state of disrepair. It served, until the late 1980s, as the headquarters of Odell Scouts in Horsefair Lane..
St Francis Xavier, the catholic church on The Green in Harrold which served local Catholics for much of the second half of the 20th Century.